I wrote about the Brigantes in my blog-post of 7th November last year, but said little specifically about their Queen, Cartimandua. She is one of only a dozen or so native Britons, alive at the time of the Roman conquest, whose name we know, and one of only two women (the other being "Boudicca," which may well be a title rather than a name). Cartimandua ruled over a territory which included most of modern Yorkshire and Lancashire, as well as parts of the midlands. The triumphal arch of the Emperor Claudius, in Rome, records that he took the surrender of eleven native rulers in 43 AD, but does not name them. It seems likely, however, that Cartimandua, or her father, was among them. 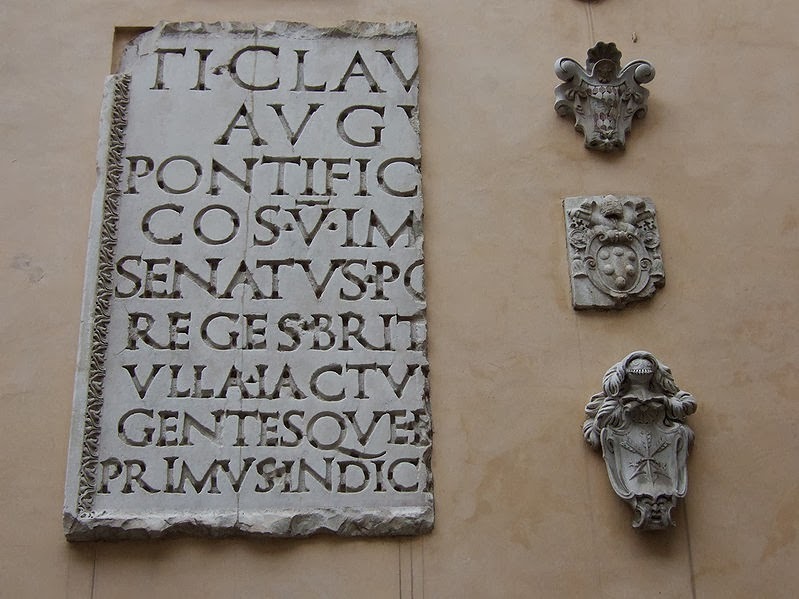 Inscription from the Arch of Claudius in the Capitoline Museum, Rome. Photo: Jenni Ahonen, licensed under GNU. Tacitus, in his Histories, tells us that she was "ruler of the Brigantes, having the influence that belongs to high birth," and that she "came to despise her husband, Venutius, and took, as her consort, his squire, Vellocatus, whom she admitted to share the throne with her." Tacitus was probably playing to a trope, popular in Rome since the time of Cleopatra's dangerous liaisons with Julius Caesar and Mark Antony, of an exotic and sexually lascivious queen, but his wording is significant in that it implies (as does Tacitus's use of the word Regina, which he does not use in relation to Boudicca) that Cartimandua was probably, in our terms, a "Queen Regnant," with Venutius merely a consort. "Her house was at once shaken by this scandalous act," Tacitus continues. "Her husband was favoured by the sentiments of all the citizens; the adulterer was supported by the queen's passion for him, and by her savage spirit. So Venutius, calling in aid from outside and, at the same time, assisted by a revolt of the Brigantes themselves, put Cartimandua into an extremely dangerous position." A situation that is portrayed as beginning with a marital infidelity seems to have developed into a full-scale civil war within Brigantian territory. Vellocatus is mentioned only once, so the likelihood is that he was killed in the course of the war. The conflict was probably more political than personal from the outset. Reading between the lines, it is clear that Cartimandua favoured cooperation with the Romans, whilst Venutius argued for violent resistance. The "aid" that he "called in" from outside is probably a reference to the Catuvellaunian prince, Caratacos, who had been leading a guerrilla campaign against the Romans based in Wales. According to Tacitus, Caractacos "sought refuge" with Cartimandua, who treacherously handed him over to the Romans. The reality may well be that Venutius drew Caratacos into a failed coup attempt. This conflict, in 51 AD, may have opened the rift between Cartimandua and Venutius, but she clearly had enough support among the Brigantes to remain in power. Venutius mounted another attack in 57 AD but was, once again, repelled, only seizing power in 69 AD when, amid the chaos of the "Year of Four Emperors," Cartimandua's Roman allies could muster only a force large enough to evacuate her. "The throne was left to Venutius," Tacitus states, "the war to us." At that point, Cartimandua disappears from history. 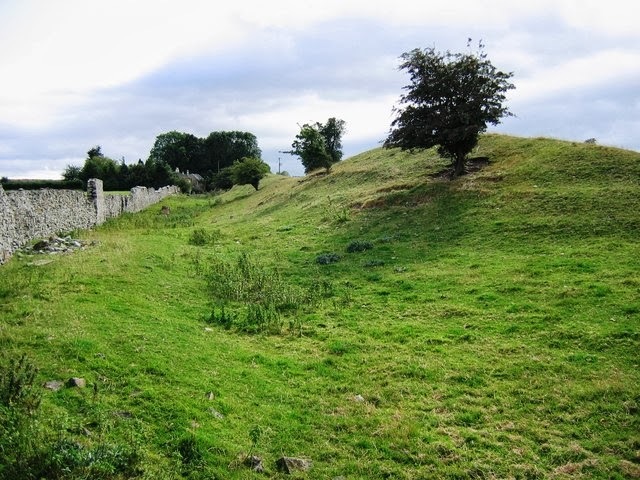 When, in 1951, the eminent archaeologist, Sir Mortimer Wheeler, was given a free hand to excavate a site of his choice to celebrate the Festival of Britain, he surprised many people by choosing the Iron Age earthworks at Stanwick, near Darlington in Yorkshire. The BBC recently published archive footage of Wheeler discussing these excavations with a young Magnus Magnusson, and these can be seen here and here. The earthworks of Stanwick. Photo: Graham Scarborough, licensed under CCA. The site is located deep within what would have been Brigantian territory, and Wheeler found evidence for several phases of fortification during the 1st Century AD. He concluded that it was probably the stronghold of Venutius. A more recent survey, however, by Percival Turnbull and Professor Colin Haselgrove, concluded that it was more likely to have been Cartimandua's base. Among Wheeler's most spectacular discoveries was the skull of a man who had been brutally executed with at least three sword-blows. Despite the circumstances of his death, however, his head seems to have been buried with respect, alongside an elaborate sword and scabbard. Had the head somehow been recovered by his own people and given a decent burial, like that of Sir Thomas More many centuries later? Could this, for example, be the skull of Vellocatus? Archaeologists and historians do not permit themselves such questions as this, but novelists cannot resist them! 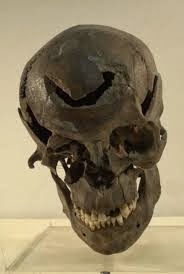 The Stanwick skull. Photo: Natural History Museum (image is in the Public Domain). 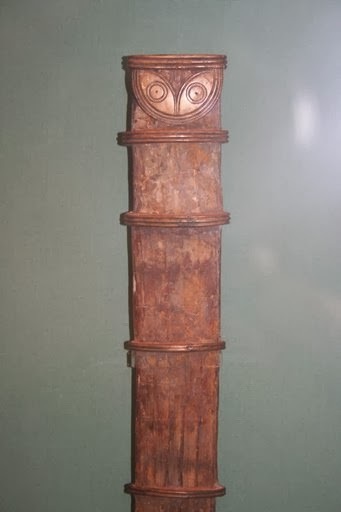 The Stanwick scabbard. Photo: British Museum (image is in the public domain). Mark Patton's novels, Undreamed Shores and An Accidental King, are published by Crooked Cat Publications, and can be purchased from Amazon UK and Amazon USA. 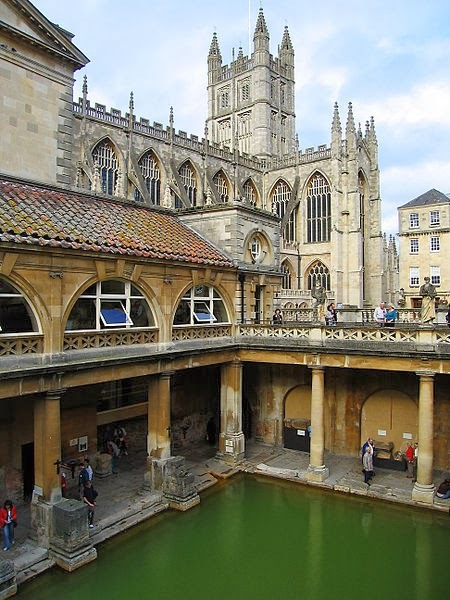 That the Somerset spa town of Bath has its origins in Roman times has long been known, but the circumstances of its ancient foundation are shrouded in mystery. The Roman baths were attached to a temple complex, one of the earliest such temples in Roman Britain, but also one of the finest. 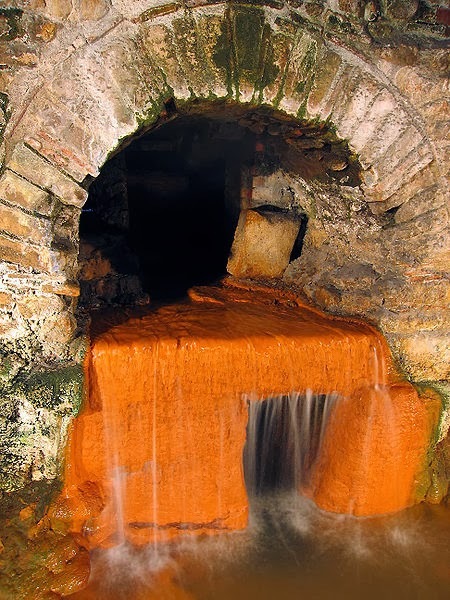 As a destination, Roman Bath may have been as much a centre of pilgrimage as it was a place for recreation and healing, for the waters were sacred to the Goddess Sulis-Minerva. The Roman baths, as restored in the Georgian period (everything above the level of the column bases is reconstructed). Photo: Andrew Dunn, licensed under CCA. It was, without doubt, the waters that first attracted people here. On a terrace 20 metres above the valley of the River Avon, a natural hot spring burst through the ground, delivering mineral-rich water at a rate of 0.25 million gallons per day. The site was probably sacred to the local Dobunni tribe before the Romans arrived. All traces of their shrine seem to have been removed by the Roman builders, but its focus is likely to have been the pool around the spring itself. Wooden statuettes of the gods may have been placed around it, and offerings thrown into the pool. The spring at Bath. Photo: Andrew Dunn, licensed under CCA. A wooden idol of the 5th Century AD from Altfriesach, Germany. Photo: Bullenwachter, licensed under CCA. The Roman temple and baths were built during the second half of the 1st Century AD, either during the reign of Nero, or that of Vespasian. It may be significant that they were constructed in the aftermath of the Boudiccan Revolt. The revolt, centred on Norfolk, Essex and Hertfordshire, seems not to have spread this far west, and the complex may have been built by the Romans as a reward for the loyalty of the local population. It has been suggested that both the British client king, Cogidubnus, and the Roman Procurator (finance minister) of Britain, Julius Alpinus Classicianus, may have had a role in its construction. 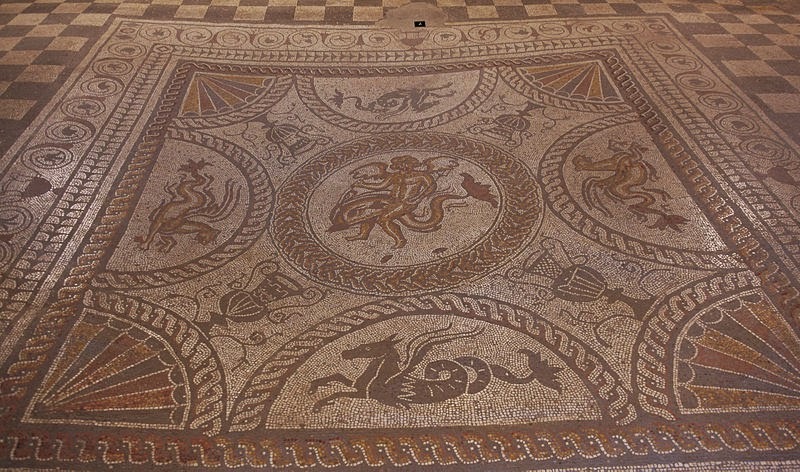 One of the mosaics at Bath has a sea-horse or "hippocampus" motif, similar to one found at the Fishbourne Palace, and the temple itself has architectural similarities with temples in and around Classicianus's home-town of Trier. 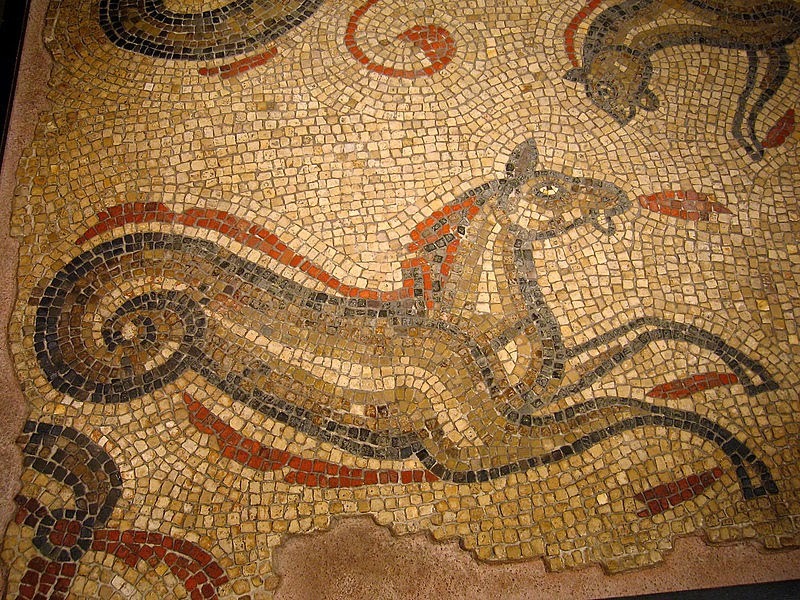 Hippocampus mosaic from Bath. Photo: Andrew Dunn, licensed under CCA. Hippocampus mosaic from Fishbourne. Photo: Mattsuch, licensed under CCA. The temple was dedicated to Sulis-Minerva, a deity unique to Bath, with a dual British and Roman personality. 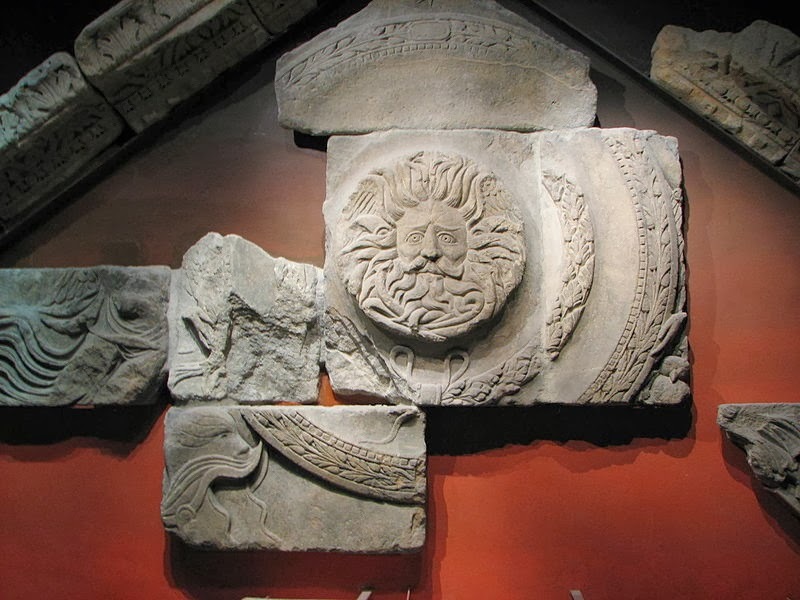 The pediment, however, bears the image of a male deity, perhaps the Roman God, Oceanus (Cogidubnus dedicated a temple to Neptune and Minerva at Chichester), but with the hair of a gorgon. Like Sulis-Minerva, the Roman god may be associated with a local one, such as Nodens, Belenos or Grannos. 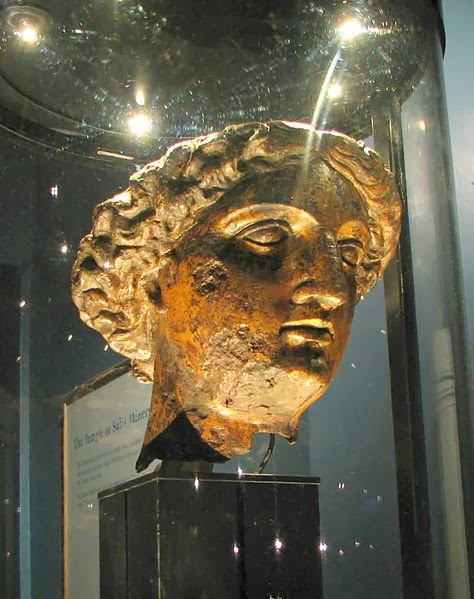 Bronze head of Minerva from the temple at Bath. Photo: Bernard Gagnon, licensed under GNU. The pediment of the temple at Bath. Photo: Bernard Gagnon, licensed under GNU. It was on the basis of this evidence that I made Bath (or rather the Springs of Sulis, before "Bath" or its baths and temple were built) the backdrop for a crucial scene in Chapter 12 of my novel, An Accidental King. The temple and baths remained in use throughout the Roman period, and vessels of pewter, copper and silver were deposited in the pool as offerings. They fell into disuse when the infrastructure of Roman Britain collapsed in the 4th and 5th Centuries AD. This, however, was not the end of the story. The ruins of the temple and baths are thought to have inspired the 8th Century Anglo-Saxon poem, The Ruin, which can be read here (in Anglo-Saxon and English translation): the poem is also recited on a video-link here. My thanks to Alison Morton for inviting me to be part of the "My Writing Process" blog tour. 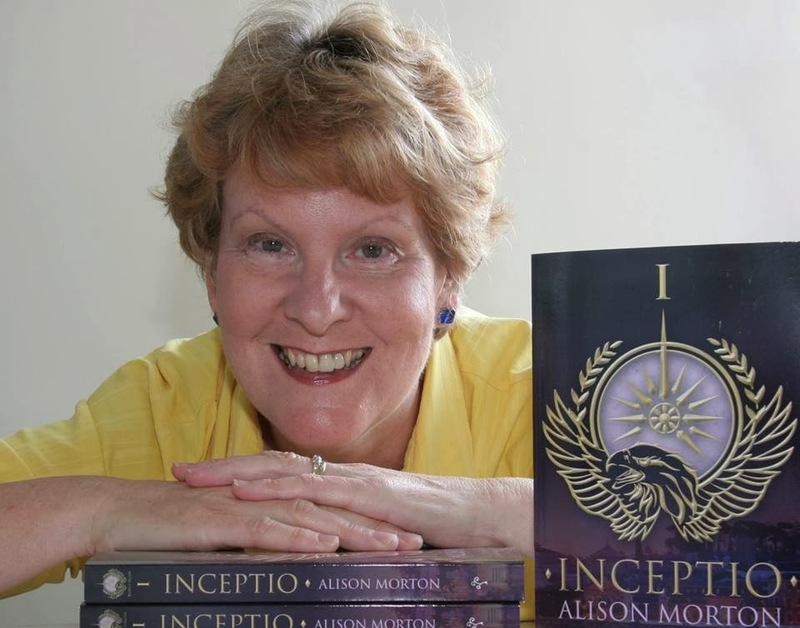 Like me, Alison has published two novels, Inceptio and Perfiditas, and will soon publish a third, Successio. The Song of Strangers - In 4000 BC, a sorceress is cast out from her community. She finds comfort in the arms of an adventurer from a distant land, but does not know whether she can trust him, or where their relationship will take her. The stories are connected by a physical place, by suggested genealogical links, and by objects from one period which turn up in another. Each book is different, but I'm not afraid to work within a tradition. My first novel, Undreamed Shores, was inspired by Homer's Odyssey, and by William Golding's The Inheritors; my second, An Accidental King, by the biographical novels of Robert Graves, Marguerite Yourcenar and Hilary Mantel. Omphalos is inspired by multiple-narrative novels such as Italo Calvino's If, on a Winter's Night, a Traveller ... ; David Mitchell's Cloud Atlas; and Sebastian Faulks's A Possible Life. All draw on my own fascination with history, and explore aspects of the relationship between the present and the past. I aim to give readers a thoroughly immersive experience of the past, leading them through worlds that are, at the same time, strikingly familiar and disturbingly alien. There are subtle threads that connect all of my published work, non-fiction as well as fiction. I write what I'm passionate about. I think it's the only way. I make no attempt to "write for a market." The market is fickle and, even if I were to identify a trend, and try to write something on the basis of it, the trend would have dissipated long before the book ever came to print. The idea for a book or story can come from anywhere: a film; a photograph; a place I've visited; a throw-away comment in a historical source; but, once I have an idea, I will run with it, and won't stop until the book is published. 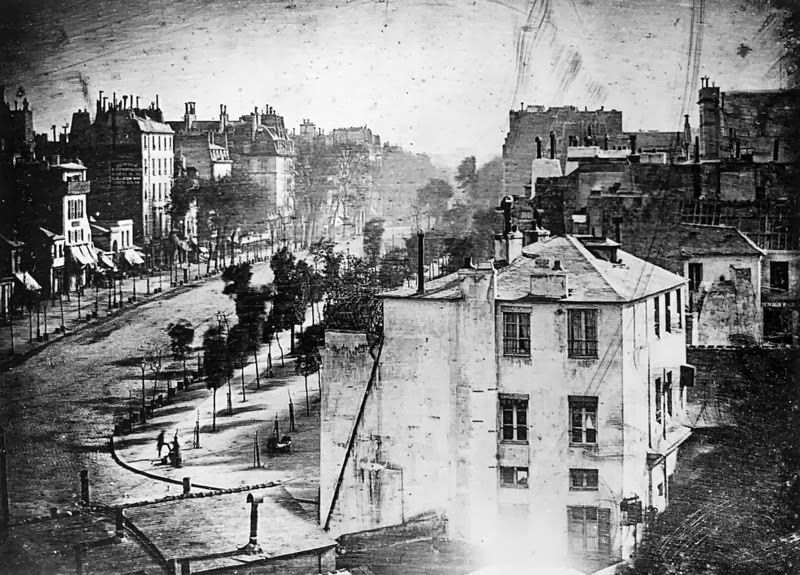 Le Boulevard du Temple, by Louis Daguerre, one of the first ever photographs, which inspired one of my short stories. Photo: The Louvre (image is in the Public Domain). It starts, of course, with an idea, and that, as I say, may come from anywhere. The idea generally comes with one or two characters (historical or fictional) already attached. Then there is the research, and research really matters to me. A sense of place is important, too, so I try to visit the places I'm writing about, coming back with reams of notes. I spend a great deal of time in archives, at the British Library, for example, or the London Metropolitan Archives. My research for Omphalos had me trawling through the records of British camps for German prisoners in the aftermath of World War II; secret intelligence reports of the 18th Century; and the 12th Century Latin manuscript of the Liber Sancti Jacobi. I do most of my research up-front, but almost always find myself returning to my sources to check details. When it comes to the writing itself, I generally take the text through 12-15 drafts. One piece of advice I'd give to writers starting out is to join a critique group; I greatly value the feedback I receive from other writers. 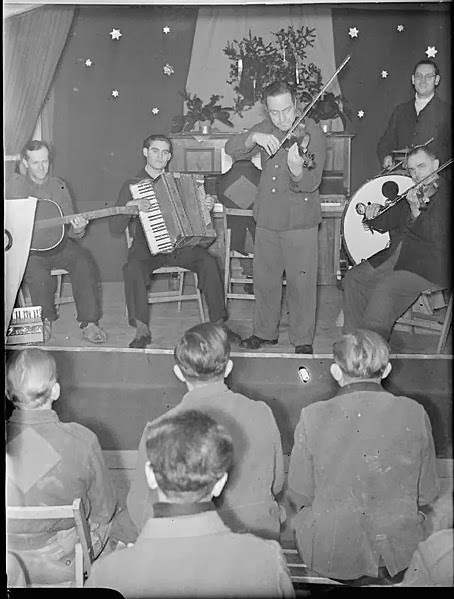 German prisoners of war in an English Camp. Photo: Imperial War Museum (IWM non-commercial license). 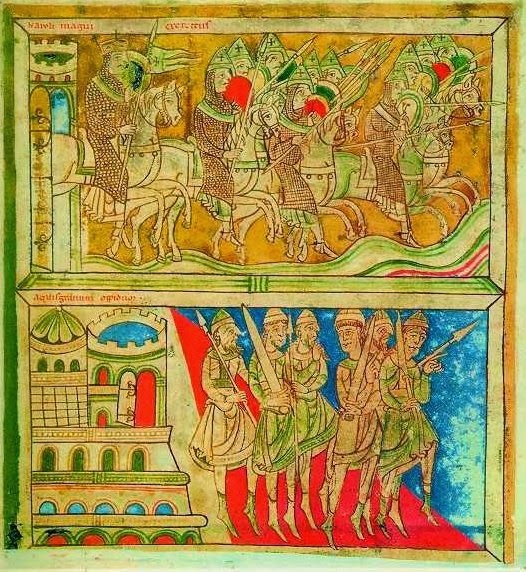 A page from the Liber Sancti Jacobi. Photo: Anouris (image is in the Public Domain). Now I'll pass the pen on to two other writers who'll be answering these questions on their own blogs on 17th February. 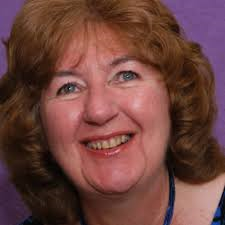 Nancy Jardine is a former primary school teacher, who lives in the fabulous castle country of Aberdeenshire, Scotland. A lover of history, it sneaks into most of her writing, along with many of the fantastic world locations she has been fortunate to visit. Her published work to date has been two non-fiction, history-related projects, and five novels. Three of the novels are contemporary mysteries; two are Celtic/Roman Britain historical romantic adventures - the third in the Celtic Fervour series is due in spring 2014. Maggie Secara loves to explore the heroic ideal, to find the mythic in the everyday, and discover the places where the realms of faerie intersect the mundane in time and space. A writer from a very early age, Maggie's poetry has appeared in a variety of magazines on- and off-line. Her first novel, Molly September, is a rollicking pirate adventure. In April this year, The Mermaid Stair (Crooked Cat Publications) continues the Harper Errant fantasy series that started with The Dragon Ring and The King's Raven. Maggie and her very understanding husband live with their cats, hats and remote control cars in Los Angeles, California, while they try to figure out a way of moving to England. More than two centuries ago, the head of a massive statue came to light at Bosham, on the shores of Chichester Harbour. Its features were badly degraded: some suggested that it was a statue of the Norse God, Thor; others that it was a Roman Emperor, perhaps Nero or Vespasian. It was kept, for many years, in the garden of the Bishop's Palace in Chichester, and was later moved to the Chichester Museum, and then to Fishbourne Roman Palace. It can now be seen at The Novium, Chichester's new city-centre museum. 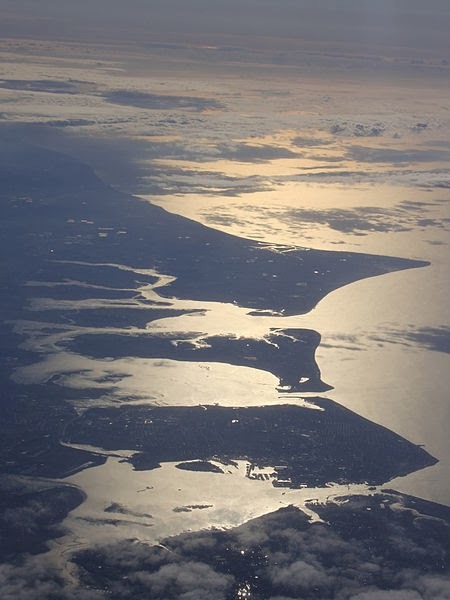 The "Bosham Head," (Image: Chichester District Council). 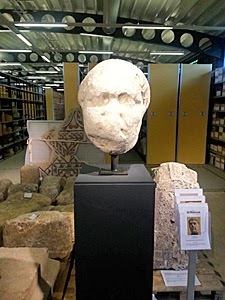 At around the same time as the "Bosham head" was being unearthed in Sussex, a more complete statue was discovered at Ostia, the port of Rome itself. Although broken (and subsequently lost), this statue was in better condition. Twice life-size, at 5.57 metres in height, this was unmistakably a statue of the Emperor Trajan (reigned 98-117 AD). Evidence suggests that it was erected as a tribute by Trajan's successor, Hadrian. I first saw the "Bosham head" many years ago, and looked at it again when I was carrying out the research for my novel, An Accidental King. I was tempted to include the statue in the book, either as Nero (perhaps erected in the aftermath of the Boudican Revolt) or as Vespasian (erected by the client King, Cogidubnus, shortly after the death of his Imperial patron). I had nagging doubts, however, and eventually left it out, a decision that I now have good cause not to regret. Dr Miles Russell of Bournemouth University has recently re-examined the head, using the most up-to-date laser technology to compare the features of the hair and face with other known Roman statues. His conclusion is a surprising one: the Bosham Statue was almost certainly of Trajan and, carved from Italian marble, was probably a copy of the one erected by Hadrian at Ostia. Both are likely to have been versions of a military statue of the emperor found throughout the Roman world. 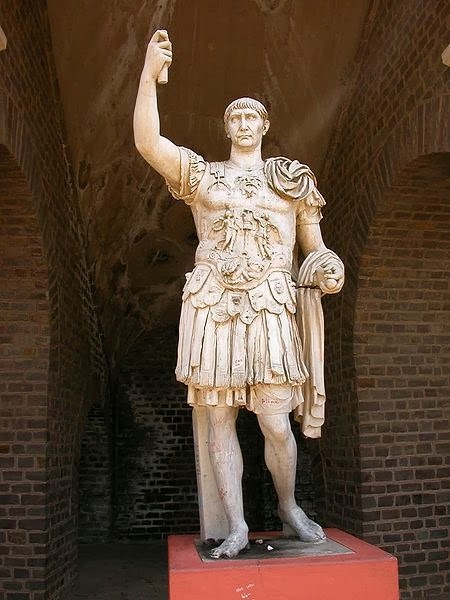 Military statue of Trajan from Xanten, Germany. Photo: Lutz Langer (licensed under GNU). Such a statue, of course, can have nothing whatever to do with Cogidubnus, who was probably dead by the time of Trajan's accession, and must certainly have been so at the time of Hadrian's. These findings suggest a direct link between the 2nd Century harbours of Chichester and Ostia. Chichester Harbour. Photo: John Armagh (licensed under CCA). The harbour of Portus, Ostia, including the hexagonal basin created by Trajan, on the side of which his statue was located. Photo: Google Maps. 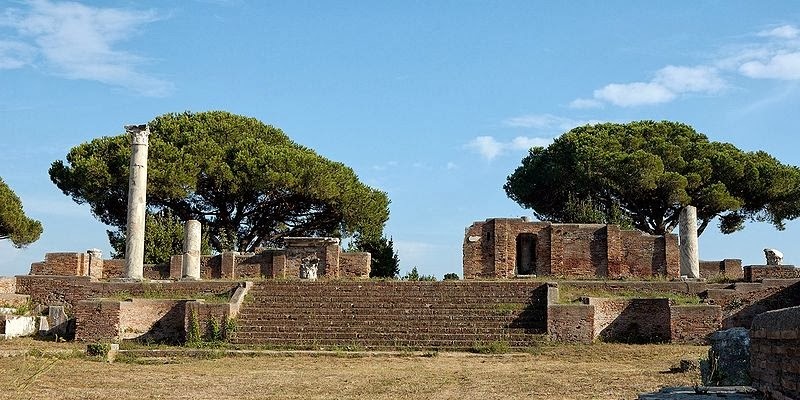 The "round temple" of Ostia, in front of which Trajan's statue stood. Photo: Marie-Lan Nguyen (licensed under CCA). Russell has suggested that the Bosham Statue, which would have dominated Chichester Harbour as its twin dominated Ostia, was probably erected to commemorate Hadrian's visit to Britain in 121-2 AD. If so, we have to wonder whether Hadrian arrived at, or departed from, Chichester. We have no indications as to who owned the palace at Fishbourne at this point in time, but it seems overwhelmingly likely that the emperor was entertained there. I have previously discussed the importance of Chichester as a Roman port of the 1st Century AD, in my blog-posts of 12th April and 5th August, 2013, but the new evidence suggests its continued importance as a harbour into the 2nd Century, long after the establishment of London as a key port and the capital of the Roman Province of Britannia.